A movie that pretty much gets it all right, from the storytelling to the action to the humor. This is another great Marvel movie. It’s by the same directors who brought us the last Captain America film, The Winter Soldier, and that movie was up there with the some of the very best superhero films to date. This one nearly knocks it off the throne. 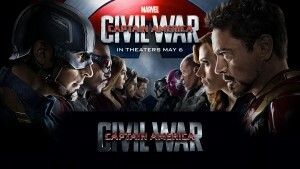 Captain America Civil War feels like an Avengers movie, and as such, it would be one of the Avengers movies that really gets things right. No giant army of aliens or robots, but instead a more grounded and practical story is at work here. There are two major conflicts, one involving government oversight in a plan known as the Sacovia Accords, the other, a struggle to bring Bucky Barnes (The Winter Soldier,) in and put him under arrest. Together, these conflicts form the base of the movie. There is a lot of action here, and it is all pretty great. But so are the dialogue scenes. The conflicts and debates between characters, regarding choosing a side, are really fleshed out. This movie takes its time and builds in momentum. That level of patience, and of carefully showing us each step, goes a long way. This is a pretty fantastic film. 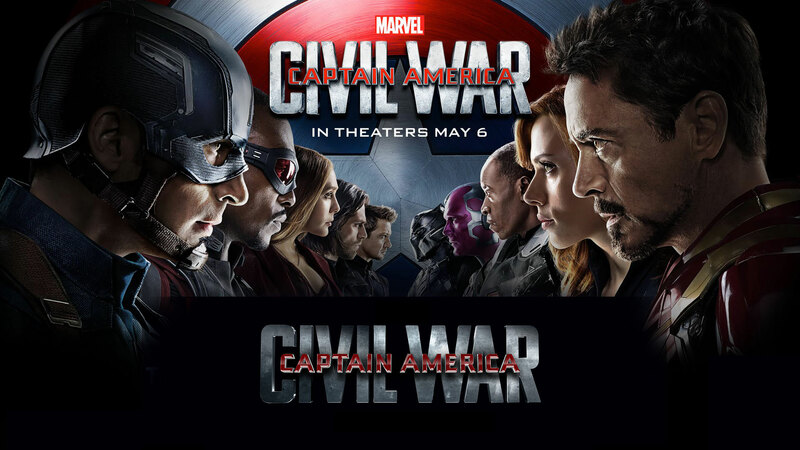 Captain America: Civil War is another Marvel gargantuan success story. This is the studio that can pretty much do no wrong. Sure, there is the occasional Thor: The Dark World, which just isn’t on the same level as the others, but for every one of those, there is are about ten other genre bending, action packed, humor filled masterpieces. Be it Guardians of the Galaxy, Ant Man, or anything else the studio takes a crack at. There is the 70s conspiracy thriller Captain America: The Winter Soldier, or the off the cuff wise cracking hilarity of Tony Stark in each of the Iron Man films. And Captain America: Civil War is the movie that more or less combines it all. The Guardians aren’t here (those will be saved for the Infinitiy War films,) and Hulk and Thor or off on another planet somewhere, but if it’s earthbound, and it’s in the Marvel cannon, then it can be found in this film. Like the Avengers movies, Captain America: Civil War combines all kinds of superheroes from all different films. The difference is this time, there’s no alien force are artificial intelligence, (unlike with the Avengers.) There’s no giant army of killer monsters to fight against. This time the enemy is us. It’s each other. This is the movie where hero fights hero, and unlike the other recent example of that kind of situation, (Batman V Superman,) this movie actually gets it right. It does that by really exploring the conflict and the debate. It takes it’s time with this, giving us multiple scenes of just establishing the argument and then watching each character weigh in on where they stand. The opening scenes show us Bucky Barnes, The Winter Soldier, in a fortress in Siberia, where he was brainwashed. This movie is absolutely a direct sequel to Captain America: The Winter Soldier, with the conflict over Bucky being a major part of the storyline here. If that movie established what was happening with Bucky, then this one takes it to the next level, making it one of two storylines that splits up the team. The other one is something known as the Sacovia Accords, and is a direct follow up and result of the events of The Avengers: Age of Ultron. So yeah, you kind of need to see some of the other Marvel movies to appreciate this one. At least those two movies. From the Siberia scene, we move to an action scene in Africa, with the current day Avengers are fighting off a team led by Crossbones, (another character whose story is a carry over from Captain America: The Winter Soldier.) We get to see a whole bunch of the Avengers in action, and some destruction that our heroes just couldn’t control or handle very well. From there, we move to Tony Stark giving a lecture about new technology. What’s amazing is the way that this scene begins with what appears to be a flashback to a very young looking Robert Downey Jr. It turns out this is not a flashback, but the technology itself, which lets you go back into past memories. There’s a lot to like about this. First off, it establishes the parent situation of Tony Stark, which will be a major part of the on going story in this film. Secondly, there is the remarkable technology that Marvel is employing to de-age Downey Jr. They used it in Ant Man, on Michael Douglas, in the opening scene. Only here, it’s used in close-up, and boy does it look great. Stark gets a little wake-up call from a woman waiting for the elevator in the building where he gave the lecture. Suddenly he’s feeling pretty responsible for the death of a kid. And that’s when the Sacovia Accords are presented to the team. The trailer for this movie would make you believe that Stark is one of the presenters, already recruited by General Ross (William Hurt.) This would be the line in the trailer, where Stark says something like, “that’s why I’m here.” Well, I’m pleased to say this is misleading. There’s no scene where Stark just shows up, having already had his meeting with Ross to get on board. Instead of having that scene off camera, in this movie, we get to see it all. Now that makes things even better. Stark is there with the rest of the team when they are all hearing about the accords for the very first time. In this way, the Russo Brothers (the directors of this film,) are able to take the conflict in baby steps and give it to us nicely and carefully, letting us watch it evolve through dialogue and debate. This was the problem with Batman V Superman. The conflict felt rushed and forced, all starting in the final portions of the film with Lex Luthor and a ridiculous kidnapping scheme. Captain America: Civil War does not make the same mistake. What it does is give us multiple conflicts so that right after the accords are presented, and we get characters on either sides of the discussion, we get a bombing that creates a whole new conflict. That new conflict boils down to a very simple mission…go catch The Winter Soldier. Reports say that he’s the man responsible. The bombing killed the South African, Waconda leader, who was the father to a man named T’Challa. This man comes from the city where Vibranium was mined, the same metal that makes up Captain America’s shield. T’Challa’s got a costume of his own, and shows up as The Black Panther, right as authorities go to get Bucky. Captain America is there to, and we get a fantastic stairwell fight. This thing is choreographed beautifully. It just might give the Netflix Daredevil show a run for its money, (which also featured a stairwell fight in season 2.) From here, we are in a parking lot foot chase with different heroes running after each other, jumping over and around cars, doing everything possible to bring the others down. This is some pretty great stuff. The action is fantastic, but so are the dialogue scenes. Tony Stark wants the heroes to sign the accords because it will mean holding them responsible. It will mean that all of the death and destruction that results from them going out on a mission will not be on their hands. The United Nations will be the ones who sent them out. Captain America disagrees. He understands that some innocent people will die sometimes when there is fighting in the streets. You can’t save all the people all the time, he says. But Captain America doesn’t want a board telling the team where they have to go and where they can’t. He’s not a man to just blindly follow orders. From his days fighting against the Nazis in World War II to his days taking on SHIELD, which turned out to be a HYDRA organization in The Winter Soldier, Captain America has seen what can happen if you let corruption and bureaucrats make all the decisions. What’s pretty great about this is that you would expect our two heroes to each be on the other’s side. Iron Man has always been an anti-establishment rebel who wants nothing to do with the goverment. In Iron Man 2, he pretty much told them to shove it when they wanted his costume. And Captain America is supposed to be the loyal soldier who does whatever his country wants. Only here, he’s the rebel and Stark is the one siding with the goverment. And the movie does a fantastic job of making us believe that they would each really be on this respective side. Each of these Marvel movies seems to introduce one or two new characters. In the first Avengers, it was Hulk and Hawkeye. In Age of Ultron, it was the twins and The Vision. 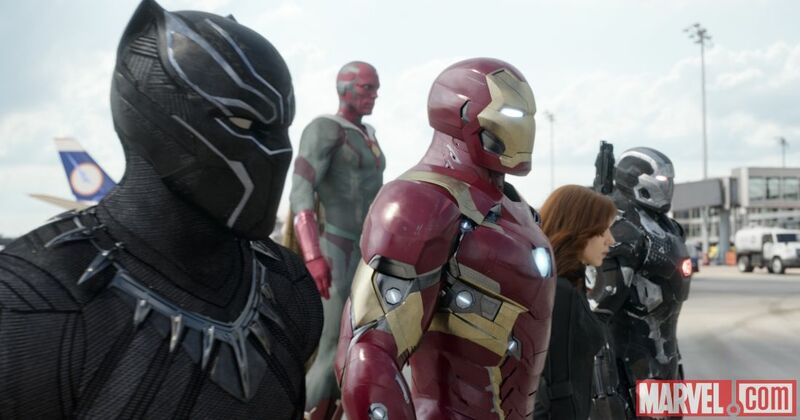 Here, in Civil War, it’s The Black Panther and Spider Man. They are both great. Spider Man, in particular, is handled perfectly. First off, he’s a kid. As played by Tom Holland, a boy of about eighteen years old in real life, this might be the first time that a movie has gotten the Spider Man character right. Not surprisingly, that’s exactly what happened with The Hulk in the first Avengers film. There had been two previous incarnations of the character, (played by Eric Bana and Edward Norton,) and only the Marvel version, featuring Mark Ruffalo, turned out to be great. The same can be said of this Spider Man. He looks and acts perfect. The humor practically leaps off the page when Holland is on screen, really showing himself to be a kid with one simple goal. To impress Mr. Stark. One of the best lines in the movie comes in a fight when Spider Man just won’t stop talking. The humor is there, in this movie (I love the “can you move the chair up,” line in the car scene,) but so is the story. There’s a great twist moment at the end of the film that leads to even more conflict in ways that take things to the next level while also making sense of things that we’ve already seen in the film. Other movies, like Batman V Superman, would have the heroes team up at the end to fight a bigger baddie. That’s how these movies always tend to go. Not this one. Instead, it leads us down the paths of all kinds of red herrings. It makes us think this will be another one of those films, with new enemies being discussed at the start of the final act, and our heroes seemingly putting aside their differences. That’s exactly when the iron strikes and the rug is pulled out from under us. This movie has lots going for it, but there are also a couple of flaws, here and there. The villains aren’t particularly great. On the one hand, it’s a positive that the heroes don’t put aside their differences to fight a bigger villain at the end. On the other hand, without that huge monster that serves as the climax to every film, something kind of feels missing. And then there are the scenes that just aren’t fleshed out enough. Like the end of the airport fight, where one of the teams apparently gets captured by the other, only we never get to see it. Or a letter from one camp to the other, at the end of the movie, that feels kind of forced. So there are definitely complaints to be made, but for everything this movie gets right, it’s hard to be very angry about the little things. The story is great, the humor is there, and the action is fantastic. You really couldn’t ask for a whole lot more.